First, the short story. Then, the long one. Two-book deal with Harper Collins. Yes, two books. That means they will publish Truest AND the next book I write! 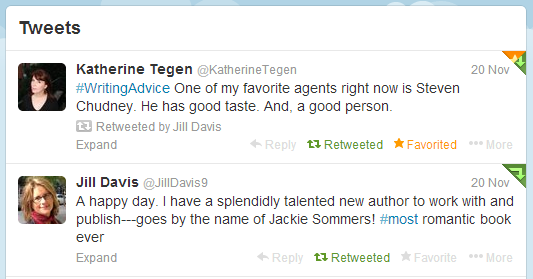 Jill Davis is my amazing editor, and she loves my novel, loves my characters. And I love her! Last week, Steven Chudney (my amazing, amazing literary agent) told me that Jill Davis with Harper Collins loved my story and would be presenting it to her boss. My friends and family and I were all praying that her boss (Katherine Tegen) and everyone else involved would also want to jump aboard the Truest ship. My friends who pray prayed, my friends who don’t pray aimed their positive energy toward NYC, and everyone kept their fingers crossed. All weekend, I kept thinking, I hope that they can’t stop thinking about my story. Tuesday night, I journalled about it a little bit, first that they must have decided against it, since we hadn’t heard anything in the first couple of days. Then I thought, Well, actually, it’s only the middle of the week. Maybe we’ll hear something tomorrow. Wednesday, Steven emailed me and asked me to call him. Since I work in a cubicle (goodbye, privacy! ), I bundled up in my winter coat and went out on the veranda and made the call. I was shocked and amazed and thrilled and overjoyed when Steven told me that they made a TWO-book offer! I asked Steven what the next steps were, and he said, “I don’t know about you, but I’m buying myself a good dinner tonight! I suggest you get some champagne and celebrate!” LOL! He’s so great! Jill and I talked on the phone today. She. is. AWESOME. She loves my story and my characters and told me, “You’re a DREAM.” I love her to pieces after just one 40-minute phone call. So, when will Truest be published? Probably not until 2015. Sit tight and save your pennies!!! This entry was posted in creativity, dear diary, real life, writing, YA and tagged jackie lea sommers book deal, jackie lea sommers harper collins by Jackie Lea Sommers. Bookmark the permalink. Congrats. You must be high as a kite. I’ve been floating on air since Wednesday afternoon!! Awesome Jackie! We have been praying for it! Can’t wait to read it! WOW, called “the most romantic book ever!” Congrats! Thank you, Mads!! You’re so great!!! ONGRATULATIONS JACKIE!!!!! So happy for you! Your hard work (and talent) has paid off! Thank you so much, Janet! I am just thrilled. This is so exciting! Congratulations!!! 🙂 I’m really happy for you. Yeah Jackie, the Hanson’s are so happy for you! Can we have your autograph? YAY! YAY! YAY! You are such an inspiration. I can’t wait to read your books! Eeeep! Thank you so much, Alison! It’s so lovely to have my friends around the blogosphere be excited with me! SO SO SOOOOOOO excited for YOU!!! (And myself, since I am dying to read Truest!!) What a wonderful early Christmas present. 😀 Congratulations! Huge news, CONGRATULATIONS! I’m so pleased for you! Hope you’re enjoying your celebrations! Where can I buy your book once it’s published and how soon will it be before I can buy one? It will be worth it. You are going to be so rich! ;P How does that work if you don’t mind my asking. I’ve always wondered that. Do you earn a portion of the sale for each book along with your editor and the establishment you sell it in? Publishers offer the author an advance (money up front), and then you have to “earn out” your advance as you make a percentage of each sale. After you’ve earned out your advance, you get royalty checks twice a year (if your book is still selling!). Thanks, Julian! The querying process was super emotional for me, even though it only lasted a month! I wish you all the best! !